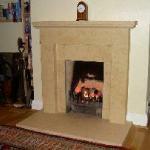 A beautiful crafted fireplace in Portuguese Limestone We have one in stock at a hugely discounted price. The Focus RS gas fire is not included but is available. 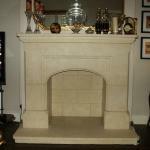 A solid limestone fireplace based on the Tudor style. This variant has a curved arch rather than the usual pointed one. 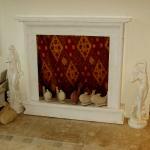 We have one remaining Tudor fire surround in stock made from Lola limestone. An elegant and simple design of fire surround. One in stock in Sunny Limestone at a clearance price. 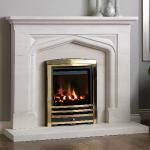 An elegant white marble raised fire surround. One in stock.